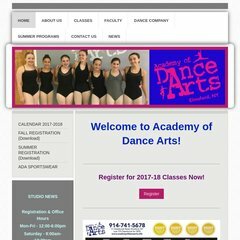 Topics: About us, Faculty, Class schedules, Dance company, Summer programs, and Guidelines. The programming language environment is ASP.NET. dns010.d.register.com, dns012.c.register.com, and dns047.a.register.com are some of its 4 Nameservers. Web.com Inc (Georgia, Atlanta) is the location of the Microsoft-IIS/7 server. PING (209.237.152.18) 56(84) bytes of data.